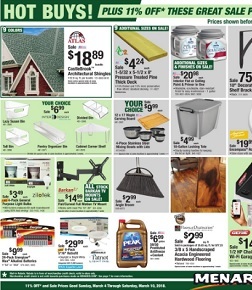 Find the Menards weekly ad sale, valid April 21 – April 27, 2019: $18.89 bundle Atlas Castlebrook 35 Architectural Shingles (32.8 sq. ft.); $42.24 8′ Above Ground AC2 Green Pressure Treated Thick Deck(Actual Size 1-5/32″ x 5-1/2″ x 8′); $20.98 Dutch Boy Dura Clean Interior Latex Paint + Primer with Stay-Clean Formula White/Base A – 1 gal. ; $14.99 Barkan Full Motion TV Wall Mount for Curved / Flat 19″ – 39″ Screens; $2.99 sq ft Floors of Distinction Rapid Loc 3/8″ x 5″ Handscraped Natural Acacia Engineered Hardwood Flooring (25.83 sq.ft/ctn); $6.99 Peak Global Lifetime Antifreeze + Coolant 50/50 Prediluted; $9.99 Energizer MAX AA Alkaline Batteries – 24-pk; $5.99 Mohawk Glasen Stone White Arabesque 12 x 10 Porcelain Mosaic Tile(Actual Size 12″ x 10″); $29.99 Bali 3-1/2″ Niagra Room Darkening Vinyl Vertical Blind 78″W x 84″L; and more.